OK so I’m a day late with this whole start of the week thing, but grapefriend has been busy! And lots of celebrating has been involved! 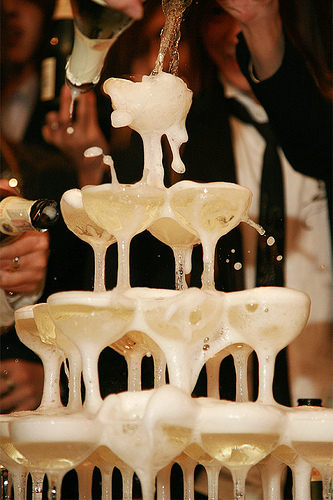 But Bubbly Week starts…NOW. So obviously it’s the holidays, and obviously most people start popping bottles of Champagne around now. Well, the bub is back, baby! Sales have been up 15% in the past 9 months and in October, Veuve Clicquot even had to hold back sales in anticipation of the holiday season. Kind of crazy! It can only be called Champagne if it’s from the region of Champagne, France. The three grapes that are officially allowed to be used are Chardonnay, Pinot Noir and Pinot Meunier. It undergoes two fermentations: the first makes it just a still white wine, then they add more sugar and ferment it again in the bottle. It’s ready to drink! Unlike other wines you shouldn’t hold it. A few great vintage Champagnes are age-worthy, but other than that drink as soon as you buy. My favorite ever is Dom Perignon, followed by Billecart Salmon and then Veuve Clicquot. Take note. Now, we love the Champs as much as Eddy and Pats, but that’s not all you can drink. Check out grapefriend’s guide to what sparkling wine to pair with your fave holiday TV specials at marieclaire.com. We’ll be going more in depth on all those this week, but for now just raise a glass of the fizzy lifting drink! Tags: absolutely fabulous, billecart salmon, champagne, dom perignon, veuve clicquot. Bookmark the permalink.